Although many of us see and encounter scaffolding often in town centres and on houses, not many people are aware of the different kinds of scaffolding available and the traits they have which make them reliable solutions for particular uses and applications. If you are planning some work and would like to know more about the characteristics of different metal scaffold types we have prepared the following guide to highlight the differences between the two most commonly used types. Which is Best, Aluminium or Steel Scaffolding? Although this seems like a straightforward question, the fact is it depends on the kind of work you have planned. Both materials have been used extensively in the building trades for years and many other applications including set design for live concerts and festivals and advertising. 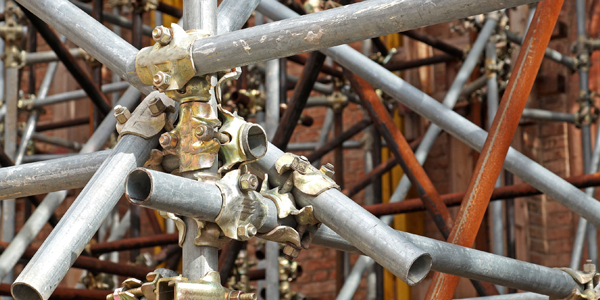 As you can probably imagine the main difference between the two types of scaffolding is the actual metals that are used that give them their defining properties. Other differences are less obvious which we have summarised below. 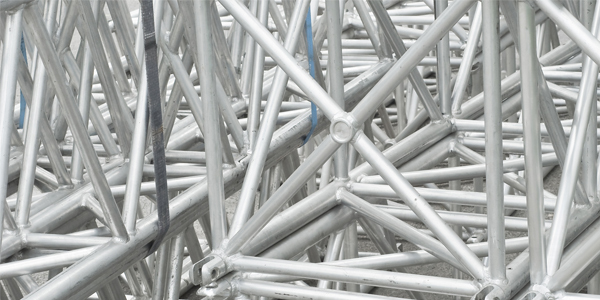 Aluminium is a popular choice for scaffolding due to its weight. As it is a light metal it is easy to move scaffolding around the site and much less labour intensive to erect and deconstruct scaffolding platforms when required. This versatility makes it a popular choice for many shorter term jobs where the scaffolding is only required for several days or jobs which may need frequently assembling and disassembly of scaffold platforms. Another advantage to the reduction in weight compared to other materials is the ease to transport it to and from jobs. This may sound like an insignificant factor, but for companies which often transport scaffold tubes across the country this could represent a significant saving in time and effort when travelling to and from jobs in the long term even a reduction in fuel bills as carrying extra weight can hurt your fuel consumption. The tradeoff to the practicality of reduced weight is that aluminium cannot support as much weight as steel and other metals. This means that a similar aluminium structure will not be able to accommodate as many workers or as many tools or heavy materials compared to a steel alternative. However, with careful planning and consideration, this will not cause issues when erected. An attractive alternative to aluminium, steel is mainly chosen for its weight and the additional support this provides. The benefits of the weight are apparent when planning larger scale jobs and projects which require scaffold to be erected and kept in place for extended periods of time. As it can be labour intensive and time-consuming to transport and set up steel scaffolding platforms, it makes sense to use them for longer-term projects. Although steel is undoubtedly a heavier material, it is not entirely impervious to damage and wear. Light surface damage to an aluminium tube does not make any noticeable difference to its integrity or functionality due to the composition of the metal. On the other hand, knocks or scrapes to steel scaffolding tubes which are undetected can create surface rust which can eventually penetrate through the entire tube. Aside from weakening the structure, the colour from the rusting process can also discolour surrounding materials and surfaces. However, as with aluminium, with proper planning and care, these characteristics will not cause problems on your proposed work site. If you are planning any work that requires scaffolding for your home or commercial premises we are always ready and willing to advise the best scaffolding solution and provide quotes or deal with any other enquiries. To find out more speak to a member of our team today.